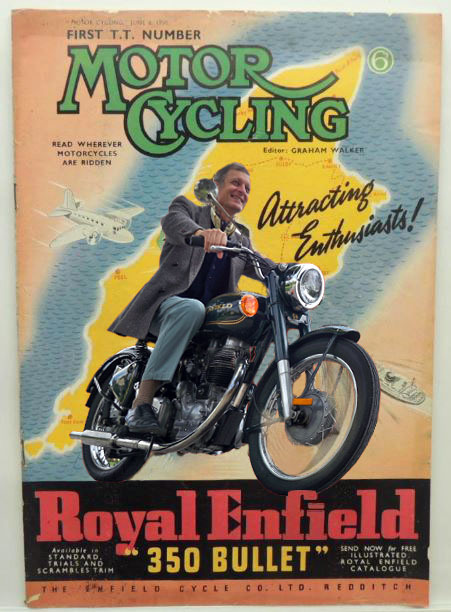 Royal Enfield and happy rider on magazine cover. The Royal Enfield Bullet and smiling rider on their way to the Isle of Man on the cover of the June, 1950 copy of Motorcycling magazine perfectly captures how I felt when I bought my 1999 Bullet. I spotted this cover for sale on eBay in Pennsylvania. The image is so perfect, in fact, that I attempted to recreate it — with my Bullet and me on the cover. I used a photo my daughter Anna took of me on the motorcycle, distorting it somewhat to more-or-less fit. The photo is distorted in another way, as well. While the original rider was clearly at speed, Anna photographed me at zero miles per hour. If I was moving I would be wearing my helmet. I should have buttoned the jacket! Same cover, different happy rider. Excellent, and perfectly recreates the spirit of the original. I would imaging that many of us identify with that 'RE' smile. Don't know how you did that, but I'll give you an "A". Great work!